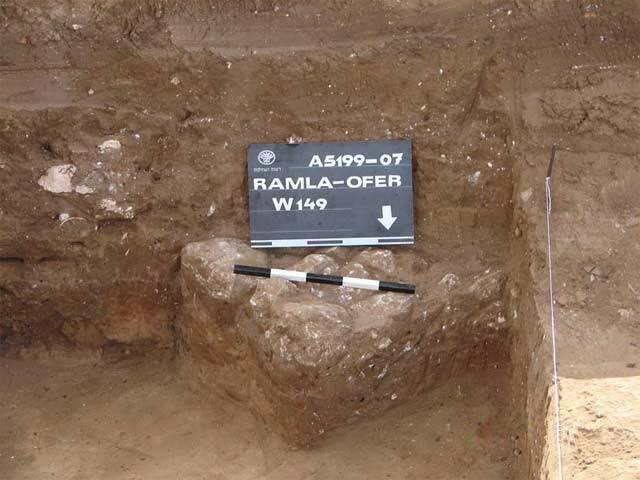 During July and October 2007, a salvage excavation was conducted at the ‘Atidim School in Ramla (Permit No. A-5199; map ref. 18668–72/64785–9), prior to construction. 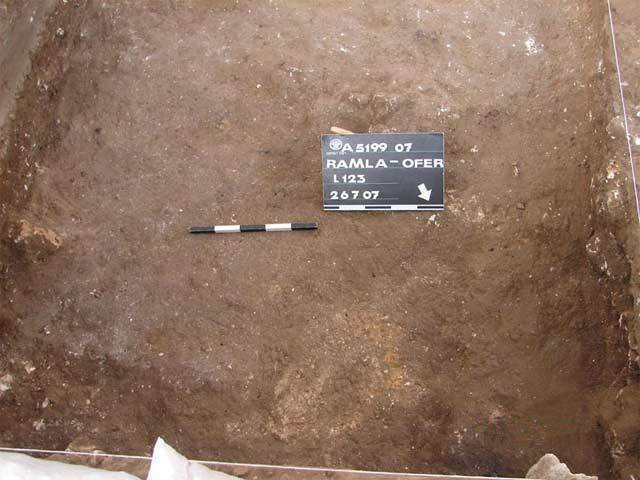 The excavation, undertaken on behalf of the Israel Antiquities Authority and underwritten by the Ramla municipality, was directed by E. Oren, with the assistance of E. Bachar and S. Ya‘aqov-Jam (administration), A. Hajian, T. Meltsen and R. Mishayev (surveying), M. Avissar (ceramics) and M. Shuiskaya (drawing of finds). Previous excavations nearby revealed settlement strata that included dwellings, industrial and commercial buildings and a variety of installations that dated from the eighth to the tenth centuries CE, until this part of the city was abandoned, probably in the wake of an earthquake (HA-ESI 111:56*; Permit Nos. A-3446, A-3592). Upon removal of a fill layer (thickness c. 1.5 m) that contained modern refuse, seven squares were opened (A1–A7; Fig. 1) and two occupation strata (I, II), dating from the second half of the eighth century CE until the beginning of the tenth century CE, were exposed. The remains, which did not form a coherent plan, included walls and floors of buildings and installations, which were severely damaged by stone robbery and modern activity, as well as possibly by one of the earthquakes that struck the city in the eleventh century CE. 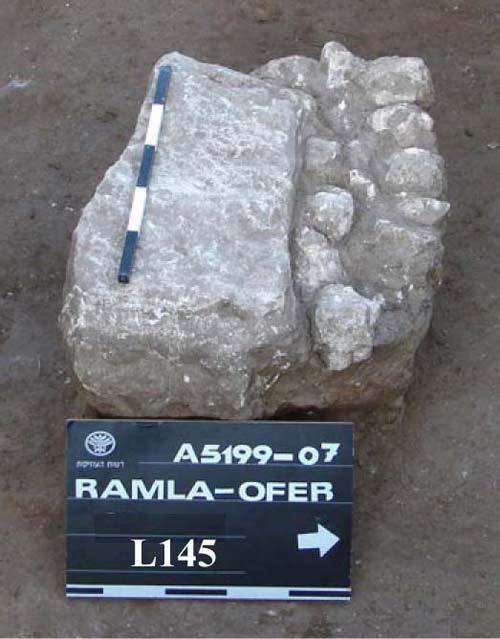 A fieldstone wall (W119) was exposed in Square A1; it was only partially preserved and a gray plaster floor abutted it (L123; Fig. 2). A burnt layer above the floor contained a basalt vessel and fragments of burnt pottery, including bowls (Fig. 3:1, 2), a krater (Fig. 3:3), jars (Fig. 3:4, 5), a jug handle (Fig. 3:6) and a lamp (Fig. 3:7). A wall built of small and medium-sized fieldstones (W146; Fig. 4) was exposed in Square A5. Parallel to and west of it was another wall (W147) of which only two fieldstones had survived. 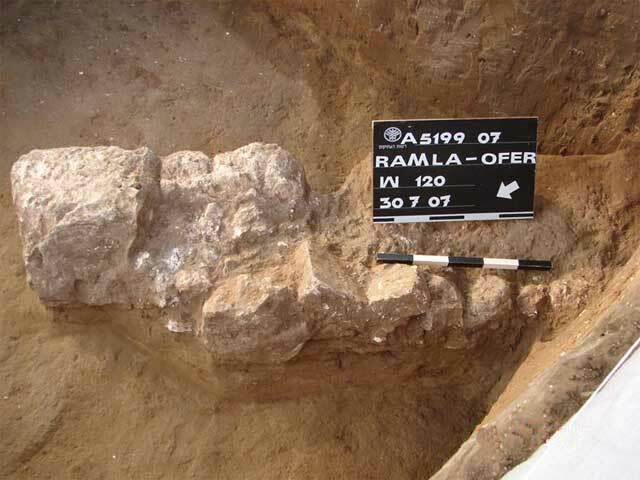 The northern part of W147 was severed by a fragment of a stone column lying on its side. 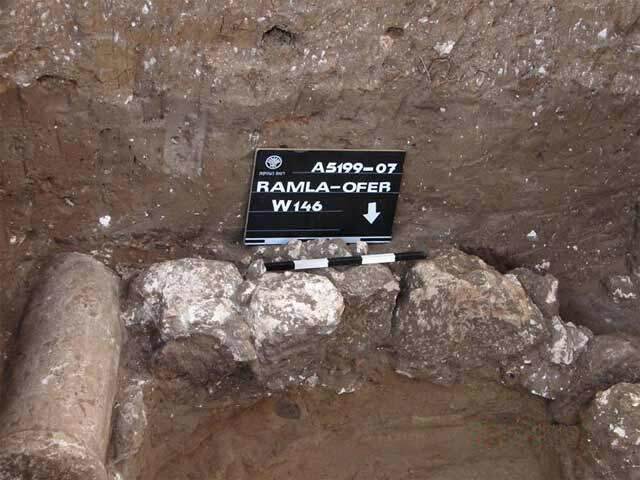 Floor remains (L157) were identified in the north of the square. A large ashlar (L145; Fig. 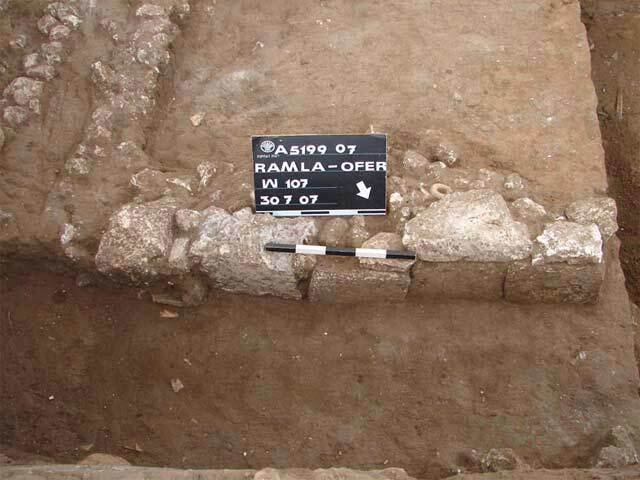 5) is also ascribed to this stratum; it was probably the base of the column that was found nearby. A wall (W107; Fig. 6) was exposed in Square A2. Its northern side was built of fieldstones and large ashlars and its southern side consisted of small fieldstones; remains of reddish plaster were found on the northern side. The wall was abutted by a plaster floor (L126), overlain with potsherds that included bowls (Fig. 3:8), a krater (Fig. 3:9), lamp fragments and pieces of marble and raw material used in the glass industry. The eastern part of W107 was severed by an installation, probably a water channel, built of two rows of small fieldstones (L130; Fig. 7). A wall (W161) was exposed east of and adjacent to the installation. The late phase in Squares A3–A7 included crushed chalk floors (L108, L142) that were damaged by modern activity. Mostly fragments of bowls (Fig. 3:10, 11), jars and a handle stamped with a seal impression (Fig. 3:12) were found on the floors. Part of a fieldstone-built wall (W129; Fig. 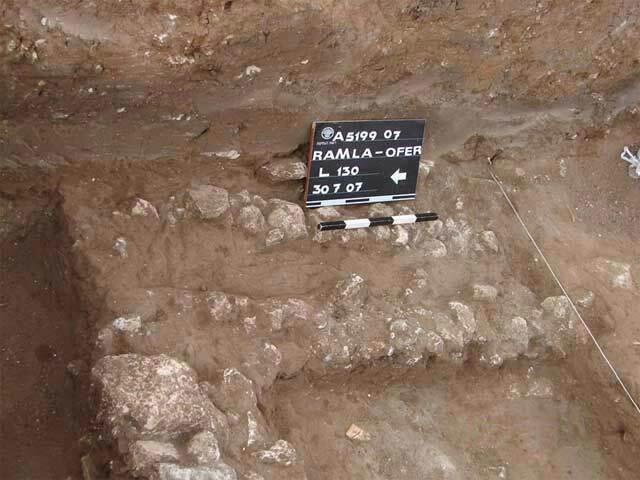 8) was exposed in the northern section of Square A1. Remains of a wall (W156) built of small fieldstones protruded from the western section of Square A5. 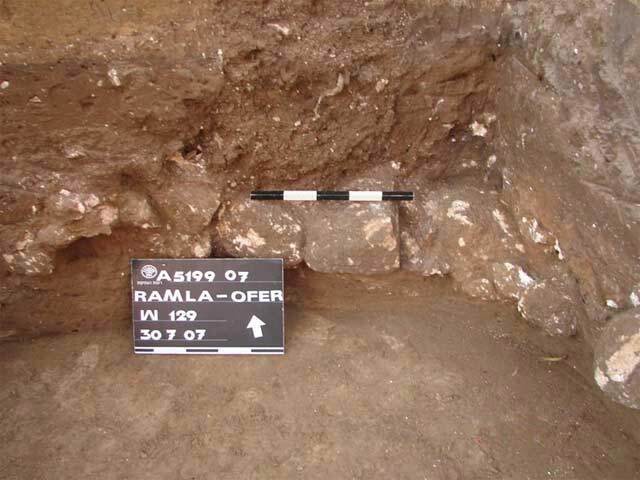 A wall built of small fieldstones (W133), set on a layer of sand, was exposed in a probe trench excavated in the northwestern part of Square A2. A cooking pot fragment (Fig. 3:13) was found on the sand. A wall (W120; Fig. 9) built of fieldstones, some of which were large, was exposed in Square A3. The wall was abutted by a tamped-earth floor (L132), founded on the surface and overlain with bowl fragments (Fig. 3:14). Other meager remains attributed to this stratum included a wall (W149; Fig. 10) founded right on the sand in Square A7 and several broken vessels (not drawn) that were discarded on the sand in Square A6 (not marked on plan). 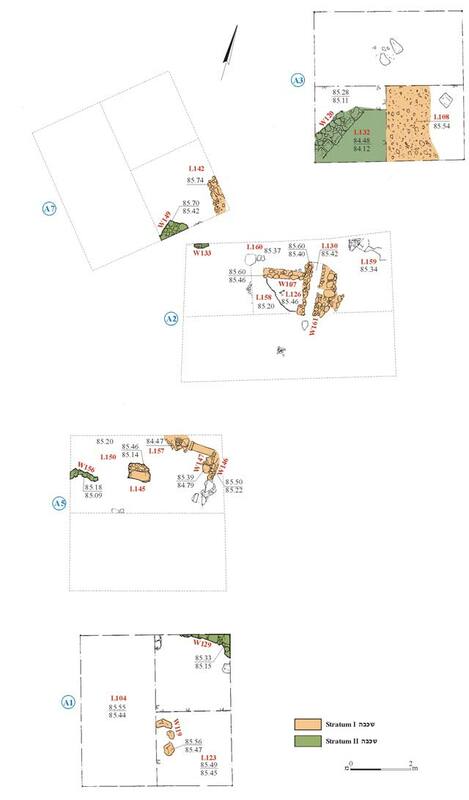 No finds were discovered in Square A4 (not marked on plan). 2. Square A1, Floor 123, looking east. 4. Square A5, Wall 146, looking south. 5. Square A5, Locus 145, looking west. 6. Square A2, Wall 107, looking west. 7. Square A2, Installation 130, looking east. 8. Square A1, Wall 129, looking north. 9. Square A3, Wall 120, looking east. 10. Square A7, Wall 149, looking south.